Shopping King Louie is about a pampered chaebol heir (Seo In Guk) who grows up alone in a foreign country and loves to shop. After arriving in Seoul, he mysteriously ends up homeless with amnesia. He then meets a sweet country girl (Nam Ji Hyun) who takes him in, and the two work together to discover who he is while having to survive the city. I have so much love for this drama that I don’t even know where to begin! Shopping King Louie is everything I love in a drama and so much more. It is the definition of a fantastic romantic comedy. The romance, the humor, the fun, the characters, and the heartfelt story all work together to create perfection in my book. First, Shopping King Louie was absolutely hilarious. I love comedies, but I’m not one who frequently laughs out loud. 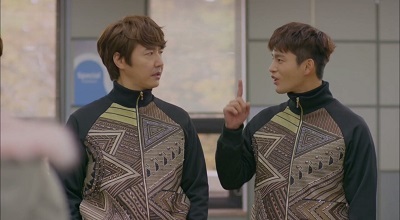 And I laughed so much with this drama! Every single episode had me grinning from ear to ear and enjoying these funny and lovable characters and the crazy situation they had found themselves. The drama was also overflowing with so many heartwarming moments. Of course, there’s the adorable relationship between Louie and Bok Sil that follows their sweet journey as a couple. They experience life’s joys together and find a way to laugh during difficult circumstances. And sometimes life dealt them tragic blows where they had to cling to each other for support. And my heart broke right along with these amazing characters during those times. Seo In Guk plays our title character Louie. 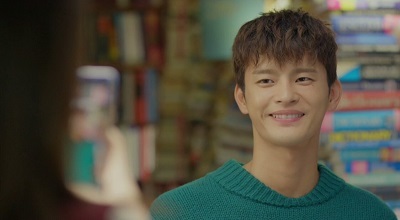 I’ve been on quite the journey with Seo In Guk. The first drama I saw him in I really didn’t care for him. His next couple dramas warmed me up to neutral. His performance in I Remember You made him pleasant. 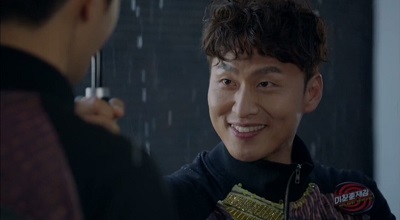 Then I recently saw him in Police Unit 38 and really enjoyed him. Now comes Shopping King Louie, and I completely loved him! Seo In Guk as Louie was so many things in this drama. He was adorable, pitiful, hilarious, spoiled, and sweet. And man did he bring on the feels! I completely adored Louie and found myself wanting to take care of him right along with Bok Sil! 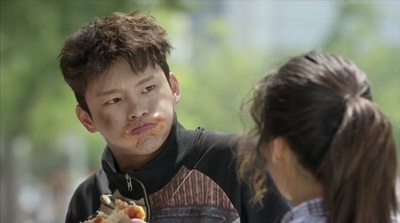 I really loved getting to see Seo In Guk in such a comedic role. He has so many great facial expressions and adds so many little nuances to his character. His comedic abilities were fantastic. Louie is completely spoiled and everyone around him knows it, but he has this uncanny ability to get people to do things for him because of just how pitiful he is. It was hilarious! But despite being completely spoiled, he was completely lovable. He spends money (Bok Sil’s money!) without abandon and doesn’t know how to do anything. He’s constantly getting into troublesome situations causing him to be judged and misunderstood by those around him. But he really is a genuinely good person and that eventually wins people over. He is also the definition of pitiful, and you can’t help but feel bad for the poor guy. And I felt so sad for him as he struggled to adapt to his new reality. He ends up going on quite the journey of growth as he learns what it means to care for someone and to take responsibility for his actions. 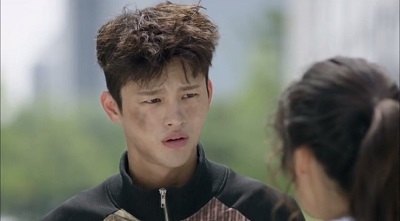 I was thoroughly impressed with Seo In Guk in this role. Nam Ji Hyun was perfect as Go Bok Sil. She is sweet, kind, and has a heart of gold. She’s also a wonderful mix of being innocent yet strong. She is the kind of person who always looks for the good in the people. And she is able to see the good in Louie. Although she initially keeps him around in hopes that when his memory returns he will be able to help her find her missing brother, it doesn’t take long for her to truly care about Louie and want to protect him. Nam Ji Hyun really delivered a character that is completely relatable. Her comedy was wonderful, and she also had so many poignant moments that both warmed by heart and broke it at the same time. I loved her so much. We have Yoon Sang Hyun as Cha Joong Won. He has a very brash personality and is easily annoyed by everyone around him, but especially Louie. But underneath that gruff persona, is a very caring man. Joong Won takes a liking to Bok Sil and really helps her as she tries to make a life for herself in Seoul. He also has a sort of love/hate relationship with Louie. These two guys had quite an interesting relationship, and they gave me a lot of laughs. We have Im Se Mi as Baek Ma Ri. She works at the company owned by Louie’s grandmother, and she has her sights set on him. But once Louie disappears, she needs to find a new way to gain some power. Although Ma Ri does several shady things, she’s not a terrible person. And her character was always presented in a likable and humorous way that allowed me to enjoy her. Then there are so many wonderful supporting characters in the drama. My favorite has to be Jo In Sung (Oh Dae Hwan). He lives in an apartment below Louie and Bok Sil with his mom. He’s a bit of a bum himself with no job and likes to loaf around. Of course, he makes a perfect best friend for Louie! These two played off of each other so well. I loved the rapport between them and the fact that I never knew what kind of crazy situation these two would get themselves in. I loved this bromance on so many levels. And I have to mention this lovely grandma. I love this actress so much! She is completely adorable at times, but she has a very strong presence too. She loves Louie to pieces and frequently refers to him as “My precious”. It was too funny. Butler Kim (Uhm Hyo Seop) and Heo Jung Ran (Kim Sun Young) also add a lot of fun to the drama. They are each unique and memorable characters. There are so many more wonderful supporting characters too that really create the wonderful world of Shopping King Louie. The relationship between Seo In Guk and Nam Ji Hyun was perfection. Louie and Bok Sil are ridiculously adorable with a relationship that is so pure and beautiful. And I love that they get to spend so much time together. From the moment they meet, they spend the bulk of their time with each other. In the beginning, I loved watching them having to survive Seoul. It’s completely new to both of them. Poor Louie is penniless and confused, so Bok Sil ends up being his protector. With no memories and no where to go, she takes him under her wing in hopes he can help her find her brother. He’s completely pitiful and helpless, and she really goes the extra mile to be there for him. But she has barely any money either, and they both begin their journey homeless. Of course, their relationship is full of laughs. Many times Bok Sil is understandably frustrated by Louie’s lack of responsibility and childish ways. But she sees that underneath, he is genuinely a good guy. And he’s so pitiful, how could she refuse to help him? Louie then falls hard for Bok Sil. And oh my goodness! The way Louie would lovingly look at Bok Sil absolutely melted my heart. It didn’t take long for her to reciprocate his feelings. So many feels between these two! But something special about this drama is that Louie and Bok Sil experience what I would consider to be a true romance. It builds from nothing and blossoms into such a healthy and loving relationship. A lot of times, couples just scratch the surface of a romance, but these two had such a strong connection. And even though Louie and Bok Sil have a very innocent and fun relationship, it felt so deep and mature. 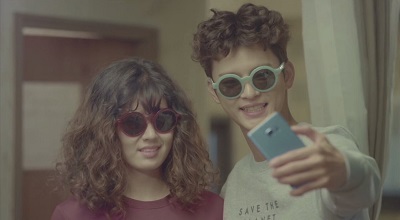 I thought the chemistry between Seo In Guk and Nam Ji Hyun was fantastic. They truly were such a treat. 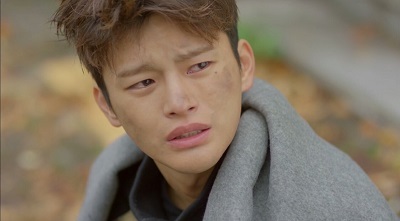 Shopping King Louie also has a nice little mystery concerning how exactly Louie ended up homeless with amnesia and how it ties in with Bok Sil’s missing brother. It was really interesting unraveling all of the circumstances that led everyone to their current situations. I also experienced so many emotions with this drama. So many times, I flipped from laughing to tears in a heartbeat. And then I would be right back laughing again. And it maintains its charm all the way through to the end. It surprised me several times, and the last episode was so moving. 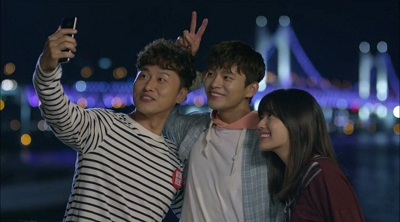 For those looking for a very fun drama without any angst and filled to the brim with heartwarming moments, look no further than Shopping King Louie. Shopping King Louie was completely amazing. I laughed so much at the crazy situations and Louie’s hilarious quirks and personality. I cried during tender moments and also during tragic ones. It was quite a journey. I loved these characters, and I simply didn’t want to leave this little world. Louie and Bok Sil were one of the best drama couples I’ve seen. They warmed my heart and made me smile so many times. All I have are fond memories when thinking about Shopping King Louie. What more could I ask for? Nothing. For me, it was kdrama perfection, and I loved it to pieces. This entry was posted in Reviews and tagged kdrama, Korean Drama, Nam Ji Hyun, Oh Dae Hwan, Seo In Guk, Shopping King Louie, Shopping King Louis, Yoon Sang Hyun. Bookmark the permalink. Haha, I had a lot to say about this drama, and this review doesn’t really even begin to cover my love for it 🙂 Since comedies aren’t usually your thing, I would definitely say save a drama like this for a time you’re feeling specifically in the mood for that sort of thing. It is definitely heavy on the comedy, but it is also very feel good and heartwarming with a nice story about the journey of the characters. Hmm… I might need to go back and rewatch this. I tried to when it first started airing and couldn’t get into it–but with a recommendation like this I should go back and take a second look. Thanks for the review! I would say the first episode is a bit different from the rest of the drama since the couple doesn’t meet until the very end of it. But if you didn’t like it after 3 or 4 episodes, I would say it’s probably not likely to click. I honestly don’t see any huge red flags with the drama as a whole though. I liked the humour (a lot), the really good acting, the chemistry between the actors, the supporting music, the story development … but at times I was a bit “annoyed” with the candid attitude of the two main characters. It was a bit difficult to relate to … I wanted to shout “Please wake up to the cruel world around you”. I am more a Mr Cha. But at the same time would it have worked if Louie & Bok Sil were not candid? Ok, so I watched this because it was #10 on your Top Ten. I didn’t regret that decision haha. I usually get bored with feel-good dramas but I was impressed with this one. The story was very basic but it somehow got everything right. Although I did feel that there was around an hour worth of fillers in episode 15 and 16. But the final 20 minutes were good enough. The feel was much like Weightlifting Fairy Kim Bok Joo (I guess?). The characters are very lovable (Kim Bok Joo is one of my favorite characters), it had a lot of funny moments, and the cinematography and OSTs were good (though not as good as Goblin’s haha). The only thing WFKBJ lacked was an intriguing story. It was purely a feel-good drama. 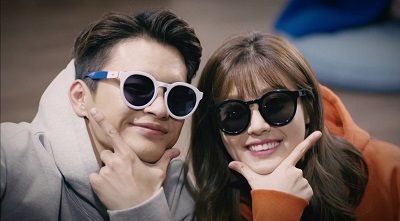 Shopping King Louis was a good 9.8/10. But giving it a 9.8 doesn’t mean it wasn’t THAT good. I’m just being conservative in giving out my 10/10s hehe. If my memory serves me right, I think I will only give my 10/10s for now to My Girlfriend is a Gumiho (10.1), Pinocchio, City Hunter, and Healer. Yay! I’m glad you enjoyed this one 🙂 I do like feel good dramas, but I typically like there to be a bit more meat to the story. But I obviously didn’t mind at all with Shopping King Louie since I completely fell in love with it, hehe. I’ve seen a lot of people compare it to Weightlifting Fairy. I liked that one, but I didn’t love it. And I agree, the main thing lacking for me in that one was more of a story. But it was cute and feel good, so I totally see the comparison with Shopping King Louie. Well, it certainly sounds like The Purge would work for moving on from Shopping King Louie! So now to Flower Boy Next Door. It’s another simple drama, but very funny and heartwarming. And Park Shin Hye is definitely unique and lovable. She has a great appeal, and she is an actress that I usually really enjoy. In order to move on from Shopping King Louis, I watched The Purge: Election Day (American suspense movie). Seems effective haha. I think I am now ready to watch another one of your Top Ten. I am fairly new to kdrama and unless you give it a 10, it’s not on my priority list. Thank you! Shopping King Louie!! Yes, I have so much love for this drama! Such a sweet and magical love story that also completely wowed me. Shopping King Louie just made me so happy 🙂 I’m so glad you got to enjoy it too! Wonderful review as always. Really enjoyed the review as much as I enjoyed watching the drama. Everything is indeed next to perfection in this drama. Has every aspect and seasoning a drama-lover would love in a great drama. Thanks for the review Kay. It’s been a sheer pleasure once again. Your recommendations never go wrong.